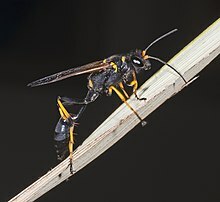 The black and yellow mud dauber, Sceliphron caementarium, is a species of sphecid wasp. There are some 30 other species of Sceliphron that occur throughout the world, though in appearance and habits they are quite similar to S. caementarium. The Latin species name caementarius means mason or builder of walls. S. caementarium is widespread in Canada, the United States, Central America, South Africa and the West Indies, and has been introduced to many Pacific Islands (including Australia, Hawaii and Japan), Peru and Europe, where it has become established in some countries of the western Mediterranean Basin (Austria, Croatia, France, Italy, Cyprus, Ukraine). This species is found in a wide variety of habitats, such as rock ledges, man-made structures, puddles and other water edges, cypress domes, in long leaf pines (Pinus palustris), and in turkey oaks. 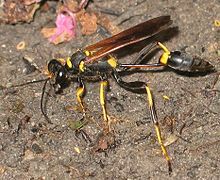 Sceliphron caementarium can reach a length of 24–28 millimetres (0.94–1.10 in). Petiole is black, about half the length of the entire abdomen. The thorax shows various yellow markings, while the abdomen is normally black, with yellow propodeum (typical of females). The eyes are black, the antennae are black and the legs are yellow, with black trochanters and femurs. The wings are a tawny color. The black and yellow mud daubers are solitary parasitoid wasps that build nests out of mud. 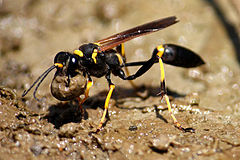 These sphecid wasps collect mud balls at puddle and pool edges for constructing nests. Frequently, nests are built inside weather, or environmental element, sheltered locations; frequently shaded areas on and within both naturally-occurring, as well as man-made structures. Examples offered but only representing a small list, include locales such as under and inside types of bridges, barns, opening and enclosing-garages, open-air porches, or under housing eaves. These nests comprise up to 25 vertically arranged, individual cylindrical cells. After initial creation and coverage of the clutch, this sphecid wasp uses more mud as a means covering and protecting the whole cluster of cells, thereby forming a smooth-like appearance, and uniform nest. The entire nest may attain an area equal to, or larger than, the size of an average human fist. 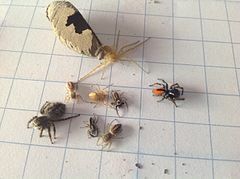 After building a cell of the nest, the female wasp captures several spiders. The captured prey are stung and paralyzed before being placed in the nest (usually 6-15 per cell), and then a single egg is deposited on the prey within each cell. The wasp then seals the cell with a thick mud plug. After finishing a series of cells, she leaves and does not return. The larva spins a cocoon and pupates. Eventually, the hatching larva will eat the prey and emerge from the nest. Adults can be seen in mid-summer feeding on nectar at flowers, especially Queen Anne's lace (Daucus carota), parsnips and water parsnips (Sium suave, Sium latifolium, Berula erecta). They have a low reproductive rate. Stings are rare due to their usually peaceful nature, however nests are aggressively defended. A common species of cuckoo wasp, Chrysis angolensis, is frequently a cleptoparasite in Sceliphron nests, and is only one of many different insects that parasitize these mud daubers. In 1996, Birgenair Flight 301 crashed near Puerto Rico. The most probable cause of this Boeing 757 crash was a blockage in a Pitot tube (device for air speed measurement) by a mud dauber's nest. Bohart, R.M., and A.S. Menke. 1976. Sphecid Wasps of the World: a Generic Revision. University of California Press. Crawford, R.L. 1987. Spider prey of the mud-dauber, Sceliphron caementarium (Sphecidae), in Washington. Proceedings of the Washington State Entomological Society, 48: 797-800. Evans, H.E., and M.J.West-Eberhard. 1970. The Wasps. University of Michigan Press. Howard, L.O. 1903. The Insect Book. Doubleday. Rau, Phil. 1916. The sleep of insects. Annals of the Entomological Society of America, 9: 227-275. Ross H. Arnett - American Insects: A Handbook of the Insects of America North of Mexico - CRC Press. Ross, K., and R. Matthews. 1991. The Social Biology of Wasps. Chapter 17, Evolution of Social Behavior in Sphecid Wasps, pp. 570–602. ^ A. Ćetković, I. Radović & L. Ðorović (2004). "Further evidence of the Asian mud-daubing wasps in Europe (Hymenoptera: Sphecidae)". Entomological Science. 7 (3): 225–229. doi:10.1111/j.1479-8298.2004.00067.x. ^ "Mud dauber wasp". Grzimek's Animal Life Encyclopedia. ^ Milne, Lorus; Milne, Margery (August 2003) [Originally Published October 1st 1980]. Field Guide to Insects & Spiders. New York: Alfred A Knopf, Inc. pp. 844–845. ISBN 0-394-50763-0. ^ a b c L. Kulzer (1996). "The Black & Yellow Mud Dauber". Scarabogram. 195: 2–3. ^ "Wasp's dangerous reputation belies its positive attributes". Florida Weekly. 2014-05-15. Retrieved July 23, 2014. This page was last edited on 18 November 2018, at 13:12 (UTC).